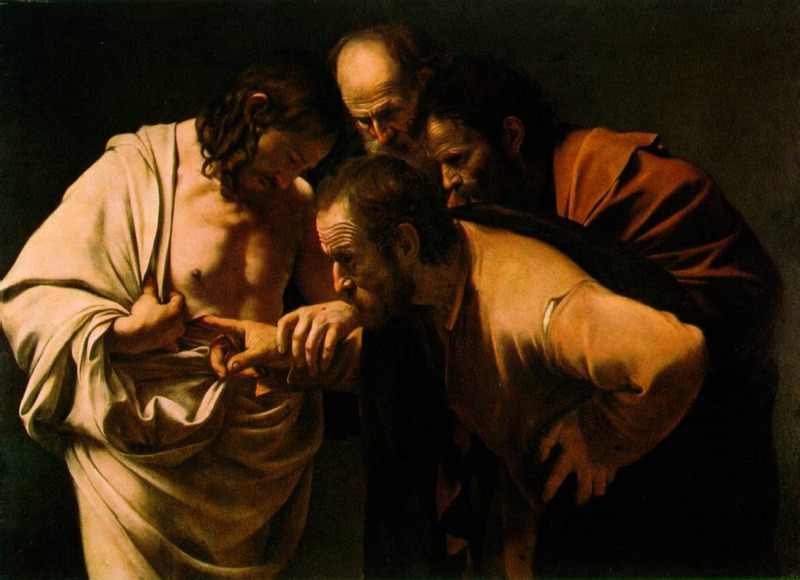 Caravaggio's "The Incredulity of Saint Thomas"
Holy Week takes a turn, down Elbow Road in Chesapeake, Virginia, interestingly enough, and toward and into the Easter moment and season. On February 13, 2012, I found myself miserably stuck in highway traffic along I-64 East. If you must know, I was caught somewhere between Williamsburg and Virginia Beach. I was on my way to Chesapeake and Bethel Baptist Church, a quintessential, if not bigger than usual, country-road church. Eventually I would attend the memorial service for a ministry colleague and friend, Melissa Cheliras, who died on February 10, 2012, at age 33. When you make a left onto Elbow Road, in fact, before you arrive at Bethel Baptist Church, you will notice something that appears to be sitting all alone in its geographical corner. Given the high-concept stature of its name, the New Creation Renewal Center announces itself with a rather modest sign. It was not lost on me that Melissa was experiencing the vast effects of "new creation renewal" herself. It is here, at this intersection, where the scripture writer passionately implores: Look to Jesus. Of course, one of the most striking features of the above image is the look on the face of Thomas the disciple. He is captured, by paint, in an expression of incredible disbelief in the exact moment of his expanding belief. Truly, here and now, the great reversal of all-things-death has begun. All things, including suffering and death, are being made new. Like Thomas, the author of Hebrews knows: Resurrection contextualizes Cross. In other words, you can't get to the church preaching the cross down the road without first passing by the new creation renewal center. Easter, for the believer, is the ultimate lens through which to see and proclaim Holy Saturday and Good Friday. Easter makes them Good, and Holy. Not to mention, strangely beautiful. At the core of the Gospel narrative, Christians believe that Easter's grand reversal gets fully revealed and embodied in the person of Jesus, who is the founder and perfecter of Christian faith in Thomas and beyond. As ever, then, the power and hope of Easter are inextricably tied to this singular person's face. It is an absolutely stunning about-face for humanity.